If you are looking for an adventure, look no further. Come and explore the backroads of this exceptional area. Northern Thailand is a region of jungle filled valleys, mountain-top temples, meandering rivers and cultural encounters. This fantastic 10-day journey begins in Chiang Mai, climbing through the mountains to the Golden Triangle, where the Mekong River marks the borders of Thailand, Burma and Laos. We ride through the spectacular limestone mountains of Chiang Dao and the scenic village of Mae Salak. On one incredible day we use a combination of bikes, boats and elephants to reach a remote Lahu village where we experience a unique night as guests of a local family, sleeping in their long-house. 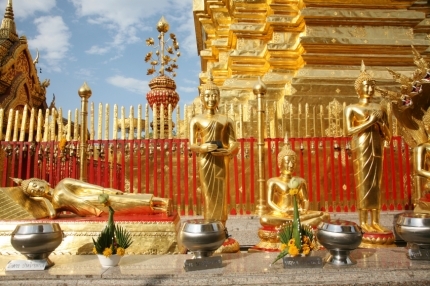 Before arriving at the Golden Triangle we visit Doi Mae Salong, and ride up Doi Tung to visit one of the region's oldest temples and check out the Burmese markets in Mae Sai. We then spend the day riding along the Mekong River before being transferred back to Chiang Mai. Much of this route is off-road through hilly regions, so some mountain biking experience is highly recommended.